Playing a percussion instrument is all about rhythm. So if you play the drums, when you get together with other musicians, you need to be able to choose the correct rhythm for each song. If you end up reading music, this task is easy because the style of the music and basic groove pattern are notated on the chart (sheet music), but if you play without music, you have to figure out what to play. To do so, you need to listen to what the other musicians are playing and immediately choose a rhythm that fits. Often, somebody tells you the basic style of the tune by saying “straight-ahead rock” or “blues feel.” This hint gives you some idea of the genre of the music, but, depending on the person’s knowledge and skill level, it may or may not really help you figure out what to play. Just nod your head knowingly and listen very carefully (asking for clarification if you don’t understand is often okay). If the person counts the song in (for example, “one, two, three, four — play”) without playing an intro, you may have to fake it until you can actually hear what the other musicians are playing. The best thing to do is play the rhythm in Figure 1 until you can figure out what’s going on. The rhythm in Figure 1 works well in these situations because it contains the core instruments (hi-hat, snare drum, bass drum), and it won’t conflict with the rhythms of the other instruments, no matter what they’re playing. Figure 1: A great rhythm to use if you’re not sure what to play. Does the song have a straight or triplet feel? You need to listen carefully to the music to answer this question. Depending on the song and the abilities of the other musicians, the feel is pretty easy to determine. In some cases, though, hearing it will prove more difficult. Fast songs in a shuffle feel, for example, can sound surprisingly like a straight feel. If you’re unsure if the song has a straight or triplet feel, asking is generally okay. However, if you’re in a situation where asking isn’t possible or desirable, the best thing to do is keep it really simple until you can figure it out (try starting with the rhythm in Figure 1). What subdivisions are being used? Whether eighth or sixteenth notes are the basis of the main rhythm determines what type of rhythm you choose. If the guitar or keyboard player uses sixteenth notes, for example, you will probably find that playing sixteenth notes on the hi-hat will fit well. Is the feel regular or half-time? To answer this, listen for the basic pulse and watch other musicians as they play their parts (they often give this information away by the way they tap or sway as they play). It’s often pretty easy to tell the feel: One style fits much better than the other. What is the length of the rhythmic phrase? After you know the overall feel of the music, start listening for the rhythmic phrasing of the other instruments. The length of the rhythmic phrase can help you decide how long you want your rhythm. 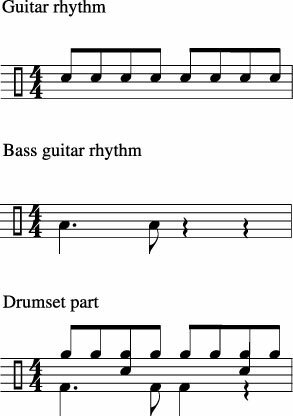 The most common lengths for rhythms are either one or two bars, although it’s not unheard of to have a groove that’s four bars long. Listen to the bass player. His or her rhythms are your cue for what to play on the bass drum. Unless you’re playing in a free-form jazz-fusion band using bizarre odd meters or you’re into experimental music where there isn’t a distinguishable pulse, the style of the song gives you an immediate sense of what to play. In most cases, you draw from a handful of established grooves. Figure 2 shows you an example of how a drum part relates to the rhythms of the guitar and bass player’s parts. Notice how the hi-hat pattern and the bass player’s notes on the one and “&” of two (played on the bass drum) matches the guitar player’s eighth-note rhythm. Because this is a rock tune, the snare drum plays on the two and four. Figure 2: This is how a drum rhythm fits with the other instruments in a band.